This special bud vase is made of high quality ceramic material. It features the special high heel shape design. 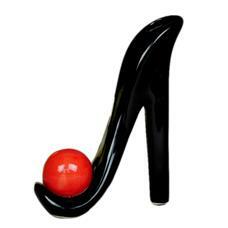 There is a beautiful red ball on the toe cap of the high heeled shoes. Your favorite blooms keep a high profile in this modern bud vase. It can also serves as artwork for a shelf or tabletop.